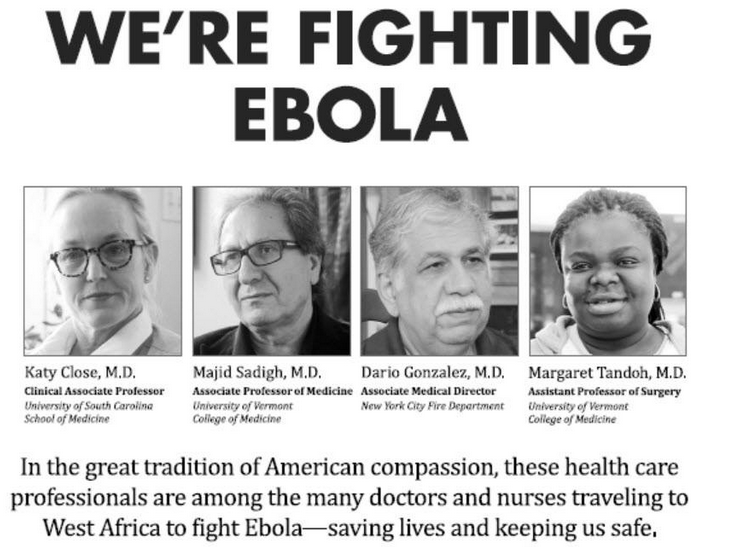 An AmeriCares ad that ran in the New York Times Wednesday includes two doctors from UVM. In a recent photo, an infectious disease expert with the University of Vermont College of Medicine is wearing goggles, a mouth mask, gloves and a plastic blue apron over a full-body protective suit. His first name — "Majid" — is scrawled on the apron in black marker. A member of the U.S. Army and three identically dressed people stand nearby. Ebola hasn't come to Vermont. Dr. Majid Sadigh, along with Dr. Margaret Tandoh, a trauma surgeon at UVM and the school's associate dean of diversity and inclusion, have gone to it. The two are spending six weeks in Liberia with the global health organization AmeriCares. They are helping to establish an ebola treatment unit in Buchannan, the country's third largest city. Tandoh was born and raised in Liberia. In an AmeriCares video shot in the John F. Kennedy International Airport before she left, Tandoh said, "I'm willing to do whatever it takes. They are my people is the way I see it. I have friends that say, 'Why don't you just send some money and you don't have to go,' but I said, 'This is home. This is where I came from. This is what made me.'" Sadigh, who is also the global health director at Connecticut's Danbury Hospital, has blogged about his experience on the school's Global Health Diaries site. On November 11, Sadigh wrote about the normalcy of the scene outside his hotel. "Even though this region lies at the outskirts of Monrovia, Liberia, a spot now known on the map for the Ebola epidemic, there is little to suggest the catastrophe claimed by American media. Of course the schools have closed, but that has permitted steady streams of boisterous children out of doors, the cheery sounds of play mingling with the quick rhythm of their drums as they amble up and down the otherwise largely deserted streets." Sadigh also noted signs that epidemic is being brought under control: "Daily reports from the local media of the decrease in seroprevalence of Ebola in blood samples collected from nearby communities demonstrate how this epidemic is slowly becoming less sinister, more manageable, not just for those of us who work here but those who live here ... "
Two days later, Sadigh described the intensity of dependence among health care workers: "We work in a chain, forming the rows of a beehive that ultimately make up a honeycombing pattern of connectivity. My survival is contingent upon my colleague beside me, on his/her attention to detail and maintenance of protocol every minute we prepare to both enter and exit a treatment unit ... Thus as I face a patient flailing with the delirium and confusion of sickness, I cannot help but think what would happen if my protective layers are accidentally punctured, if I am thus contaminated beyond the ability of sanitizing myself – not because of what it would mean to me, but for all those others who count on me." In September, Seven Days wrote about another Vermonter who spent three weeks working in Liberia — Brant Goode, a nurse epidemiologist at the Vermont Department of Health.